The City of Pigeon Forge has a 12 million gallon MGD water plant with raw water intake at Douglas Lake. The city currently has a system storage inventory of 8.3 million gallons. The tanks are as follows: Iron Mountain .5 million, Iron Mountain 150,000 gallons, McMahan Hollow .5 million, Conrad Way .5 million, Mountain View Lane 1 million, Montewood 2 million, Eagle Way 2 million, Cove Mountain .5 million, Pine Mountain Resort 39,000 gallon, Pittman Center Road 250,000 gallon, Laurel Branch #1 100,000 gallon, Laurel Branch #2 100,000 gallon, Sherwood Forest #1 71,685 gallon, Sherwood Forest #2 43,373 gallon, Starr Crest A 74,360 gallon, Starr Crest B 106,410 gallon, Bear Creek Crossing 106,410, Smoky Cove Tank 60,000 gallon, Summit Tank #1 74,000 gallon, Summit Tank #2 137,000 gallon. Additional raw water intake is available at the Vulcan Quarry located on Park Road and Waldens Creek. Work performed includes the maintenance of raw water intakes, storage tanks, maintenance and inspection and operation of the filter plant 24 hours a day 7 days a week. 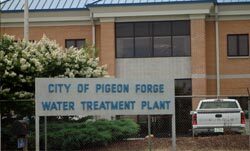 The City of Pigeon Forge also provides Gatlinburg up to a million and half gallons of water a day. There are both residential and commercial water customers. The water tap fee for customers inside the city limits is $750.00. The water tap fee for customers outside the city limits is $1,500.00. The minimum bill for 2000 gallons of water is a charge of $19.43 inside the city limits and $29.12 outside the city limits. Over 2000 gallons is $6.52 per thousand gallons of water inside the city limits and $9.44 per thousand gallons of water outside the city limits.